Lots of things take their names from The Big Lebowski: rock bands, restaurants, bars, books and more. But science? It was recently brought to our attention that two newly-discovered spiders were given very interesting names by a biologist named Ingi Agnarsson. Are you ready? That’s your name, Dude! Needless to say, we dig the way you do business, Ingi. Curious to get to the bottom of this, we contacted Mr. Agnarsson to find out more about this dramatic development in the world of biology and also, Lebowski studies. The Dudespaper: Tell us about yourself, Ingi: Are you employed, sir? Uh, well, obviously, you are. Tell us about what you do. Ingi: Employed? Is this a week day? I work at the University of Vermont and I study all things spider. 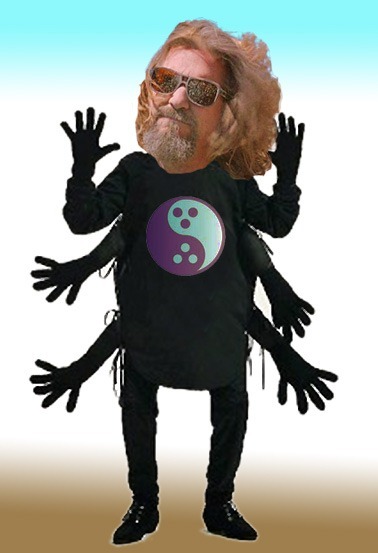 TDP: So you came up with the scientific name for two spiders, and you gave one the species name "dude" and the other "biglebowski." Proud we are of all of them. Why did you do it? TDP: Can you tell us about these spiders? Ingi: They are small spiders of the genus Anelosimus that live in the tree canopies of Tanzanian forests! TDP: Do either of them exhibit Dude-like qualities? Ingi: They’re more laid back than most spiders. Most spiders will be aggressive towards even their own kin. Anelosimus spiders, of which dude and biglebowski are two of over 60 species, usually are quite cooperative, live in small to large groups, and their stance is that this kind of aggression, towards kin, will not stand. TDP: Who is your favorite character in The Big Lebowski? Ingi: The bowling alley scene with Jesus. TDP: Is there anything about the Dude’s attitude that helps you in your life as a scientist? TDP: Did anyone else in the scientific community comment on your very far out choice of names for these spiders? Are any of your colleagues fans of the film? Ingi: Those who noticed like the names at least abide. Many of my colleagues are Lebowski fans. TDP: Do you have any plans to name any other life forms after Lebowski elements? Or anything else from so-called "pop culture"? Ingi: Sure. I did have a species name ‘fratiscoheni’ (meaning something like Cohen brothers) ready, but that did not get published (yet). We named a species after Mr. Charles Darwin in 2009 – he’s both hip and pop! TDP: Can you provide us some photos of these little spiderskis? Ingi: Photos of other Anelosimus spiders, yes, But I’ve not seen dude or biglebowski in person, so I have no photos of them. TDP: Thank you Ingi. That makes us feel very warm inside. So there you have it Dudes. The Big Lebowski is now officially recognized not just by critics, fans, achievers, Dudeist Priests, but now by science as well. Hopefully one day we will be able to see these dudelike arachnids in the flesh. Perhaps they would even make nice housepets. Maybe some of us could bring them bowling! But you probably shouldn’t rent them shoes (you’d need four pairs) or buy them a beer (it would probably kill them). If any other scientists out there are stumped for new names for species (especially of the marmot genus or whatever you call them), please consider using characters, lines, or any other what-have-you from The Big Lebowski. You probably wouldn’t want to use Bunnie, though. That might be confusing, unless it really was for a rabbit. Next Post: It’s the Zenned of the World…and I Feel Fine.